Is this the Classic Lightroom you are talking about here? I am about to do a photoshoot in Boston (I’m from Florida…) and want to use my Nikon DSLR for a documentation and journalistic purpose. Can’t carry a bunch of stuff (no laptop, too heavy) but I do have an iPad and iPhone. How can I use my iPad to put my work in the Cloud until I get home and can work on them? Is there anything I can use on my iPad that would satisfy the most minimal of work that I may have to do in Boston – like color correct, crop, etc? I can save the heavy duty stuff for when I get home. If you can get back to me ASAP here I would appreciate it MUCH. I am leaving on Thursday, May 3. The event is for Art Week in Boston on Saturday, May 5 but will be photographing ahead of that time or as soon as my feet hit the tarmac in Logan. Thank you so much for all you do. We’ve met a number of times and you relate well to all of us. Your explanations and teaching is exceptional. How do I know….I’m a teacher. Appreciate this post and love your tutorials, blog etc. I purchased your Lightroom CC Crash Course and am still working through it. Could you please help me. I “updated” to Lightroom Classic (but as we all know now, it wasn’t an update.) and I now have Lightroom CC 2015 and Lightroom Classic on my Desktop. Have you done any videos or written anything on how to consolidate them? It appears they have different photos imported. If you can’t direct me to where you have already answered this question can you tell be how to consolidate everything and just have the Lightroom Classic on my desktop? I have scoured the internet and apparently not a single other soul has this problem! Thanks! You’re the best! Matt Thanks for the summary. I am staying with Lightroom Classic. It does what I need to do and is the center of my process for managing and editing images. I have not found any replacements that do what lightroom does. Matt, While I am sure you have a certain loyalty to Adobe, I feel that all Lightroom Educators should do their part in alerting all current and potential users that Adobe is no longer publishing a User Guide for Lightroom Classic CC that is authored by them. Few or none of the “tutorials” that are available on the Adobe support site are searchable. The net effect is that we must spend countless hours watching videos from beginning to end that are not indexed. To learn the meaning and methods of using tools or terms that may not be static from one version to the next, we are forced to wade through countless forums and poorly written answers by inexperienced user who are not trained in the art of communication. Many time I am looking for a single and correct answer only to have my search return 1000+ answers and many of them do not even relate to the product I am licensed to use. Do your part and add some weight to out voice in asking for official software documentation that is kept current by the authors. To me, community forums and tutorials are barely usable and seldom relevant to the question I am interested in. Your explanation of what LR is doing is the clearest I have read. Than you. On Oct 27th I opened LR (CREATIVE CLOUD SUBSCRIPTION) to import pictures from a job….on clicking on IMPORT, LR disappeared!!! I clicked on the icon on my desktop and in the windows start up and NOTHING happened. I was lucky to get into tech support. I was told that LR disappeared because I needed to update. After updating , importing, etc., then backing up…I found that my work backed up to “Backing up to Lightroom 6-Catalog-2” : what is this about???? Do I now have two catalog backups? I hope you are passing on comments to Adobe–The name issue and all that it implies is BIG–not a positive move for all the reasons previously noted. LR has been supported by serious photographers since its inception…people who want to keep their files under their control…. Looks like Adobe wants to exploit captive customers. If Adobe does not take care of the needs of their main supporters…via LR, they will lose them in PS as well. Adobe is begging for a competitor ! Thank you, Matt. Very helpful post. Branding is sacred for marketeer. Which product carries on the band and which one is marked as legacy is no accident. Whoever carries the brand after a split, takes the following. On a related/unrelated note: Classic? Ethereum trades 30x higher than Ethereum Classic after they split. We used to use an advanced workflow tool for professional photographers. We were proud for all the feedback it took from the photography community and incorporated all these years. It felt as this was made by photographers for photographers. So on one hands there’s a complete professional photography workflow tool proven and improved in years and on the other hand there is a new cloud album/editor app… that cannot even print. We are talking Ferrari to Fiat here. And guess which one carries the brand. A US car maker has a small local plant. They make low volume, high cost, high performance cars. They buy a Korean plant. Now they can make high volume, low cost, low performance cars. They hand over their brand to the Korean model. They also keep their US model as a legacy model. Which model dies first when the shareholders ask for cuts? No 1 issue here is trust. The damage in trust that this deliberate move has caused to the people that embraced, helped shape and invested in the original product. This message is long enough. I don’t even want to start about how people were ” overwhelmingly choosing the Creative Cloud Photography plan” over the perpetual license when the latter was made virtually impossible to discover and order. And then of course they killed it. it let’s you take a RANGE (dramatic pause) and make a MASK! thank you for helping me out of a bipolar downswing, matt – your calm enthusiasm and clarity in explaining has given me courage to start your lightroom course (bought awhile ago) and let my excitement for photography out of its cage. there are no words powerful enough for my gratitude. Hi Matt. Thanks for the clarification of the name change. I bought your LR system a year ago and you recently sent out updates. Is that for the LR before the name change? Does it apply to the renamed LR Classic? Hi Shari – it is for the newest version of Lightroom (Lightroom Classic). Thanks! Your article is excellent and very helpful. I am a member of two programs with you both for Lightroom and for Photoshop but know know how to reach you other than here with my Lightroom concern. I successfully updated my original “Lightroom CC” application to the new Lightroom Classic CC and all was well for the last few days since the update. Tonight when I opened Lightroom from the dock, it opened the NEW LR CC application with an error that there was a problem changing applications. I noticed in the toolbar icon that Adobe Lightroom CC was showing a syncing in progress. I clicked on ‘pause’. I restarted the computer and opened Lightroom from the Finder. Lightroom Classic opened but all my 2017 photos (over 8,000) were missing with the file folders greyed out. In my Finder I renamed my file containing my photos (oops.. should not do stuff outside of LR) to read, “Lightroom Classic CC” . My files on my external drive are in that folder but Lightroom CC also shows in the finder with nothing in it. While in Lightroom I right clicked on my custom name plate and the it automatically renamed it to Lightroom Classic CC. How can I restore my photos to my catalogue in Lightroom Classic and eliminate the Lightroom CC application? I’m in the process of editing two urgent projects, one a wedding and another a grant application due tomorrow. Hope you can help me. I’ve been waiting for a chat with Adobe for a couple of hours and when I got through was disconnected shortly thereafter. Now I’m waiting again. Hi Linda – you can go in to Lightroom and right-click the ? mark next to the folder. Then choose “Find Missing Folder” and you should be able to relink them right there. Hope that helps. Matt, it was great to see you at MAX and I really enjoyed your session. I have a couple of thoughts on your post here. > they don’t talk back and forth to each other. > If you store your photos in a folder based system, on hard drives, and backups and all that, then this isn’t for you. 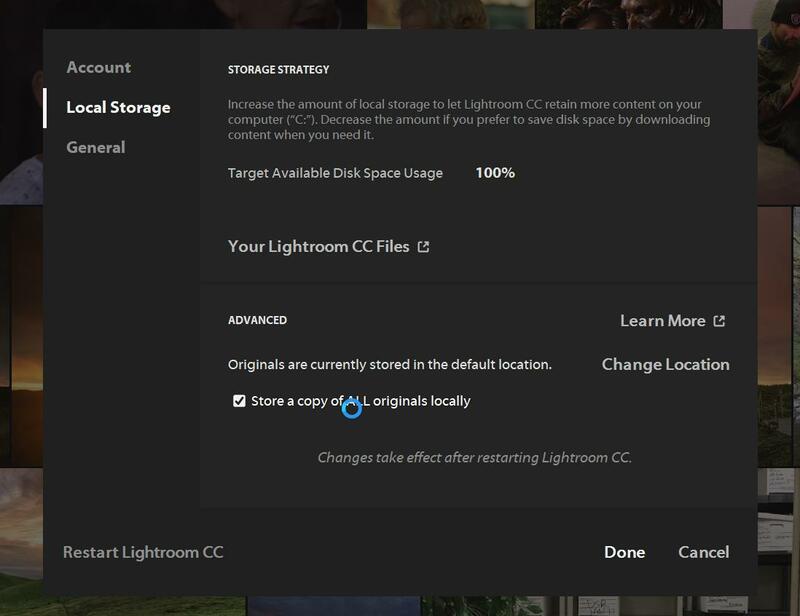 It is true that Lightroom CC is specifically cloud-based, yet you can also store all your images locally as well. In the preferences there is option to click to store locally. I don’t think that replaces the cloud, but just an fyi. I personally really like the new interface, and I’m looking forward to using the new software, even though I’m like you, capturing 64gig+ of photos just from the trip to Vegas. I’m on the full-suite plan, but still only get 100gig of storage. Given that BackBlaze provides me with unlimited storage for ~$4 a month, Adobe is asking a lot per TB, which is mighty frustrating. Hi Micah – Yes, the images to get synced, but similar to how they do if you used Lightroom Mobile. If I make a collection in LR Mobile, eventually those images get updated in Lightroom on the desktop too. But when people think of LR CC and LR Classic “talking” to each other, I don’t think that’s what they mean. I believe they mean, does it share the same catalog and work the same way – which it doesn’t. And yes, you can store them locally, but it’s not the same folder based system that LR Works with today which is why I don’t recommend it. I get it, nothing is deleted and moved to the cloud. However, adjusting a slider and having our photos put in some folder that doesn’t follow our folder organization system isn’t what I think people want. Anyway, good points though. And yes I agree. I LOVE the new interface. I want to use it. As for storage, nobody is really talking about what I think the show stopper is… how long will it take you to get those 64GB Cards uploaded? Awesome! Thanks Matt – Certainly cleared a few things up for me. I have LR 6.12 perpetual licence, never moved to CC. Just checked for updates and Adobe Application Manager came back with Lightroom CC (2015.12)/6.12. Huh? I’m leaving it alone until there is some clarity over these names. I’ve been experimenting with ON1 Raw (now 2018 Beta 2), so keeping options open. Matt, I am on Adobe creative clouds for a while. I also save my photos on Dropbox. Should I keep my. Subscription to Dropbox? The scary thing about the new Lightroom announcement, and actions of Adobe with regard to its new plans, is can we really trust Adobe for the future of our workflow. It is very difficult to invest in building a catalogue with Lightroom when Adobe, who previously stated it’s commitent to maintaining a non-subscription version, and now is discontinuing that product. Add to that the treatment of Lightroom users by the seemingly intentional withholding of raw file support for the D850 for a couple of months. It really seems that Adobe has little to no interest in its customers needs. How can anyone believe that Adobe will not, eventually, drop Lightroom Classic in favor of Lightroom CC or, at least, be slower in providing updates. I like Lightroom and would be content to pay them 9.99 a month for the rest of my life for the use of the software if I believed I would get the continuing support and timely updates promised, the software product would continue to be available as long as I need it, and pricing won’t be raised significantly in the future (especially to satisfy profitability for stockholders as more people ditch Lightroom for improving competitive products). At this point, I feel seriously let down by Adobe and must question such commitment on its part so am looking vigorously at alternative options if, for nothing else, as backup. Here’s what’s really confusing for non subscription LR users, for me at least. When I open the Adobe Creative Cloud app, my LR6 app is shown as Lightroom CC – what the heck? I know that because when I click on the ‘OPEN’ box, it opens LR6. The subscription based desktop version of LR is shown correctly as Lightroom Classic CC, which I don’t have. Talk about confusing nomenclature. While the naming conventions may seem a little confusing now, I’m sure in a few years when LR Classic is discontinued it will all make more sense. Adobe has a road map of where they want to go. The only thing missing is the time table, that will be determined by how fast their customer base can be moved over to the newer products. Matt, I’m a little confused. If we will now see initially jpeg’s instead of a raw image… We surely don’t have to click the “embedded” button each time to edit the image as a raw file? I agree with Gary. They should be lr cc (hard drives) and lr mobile cc. They even started with lr mobile functions in lr before. 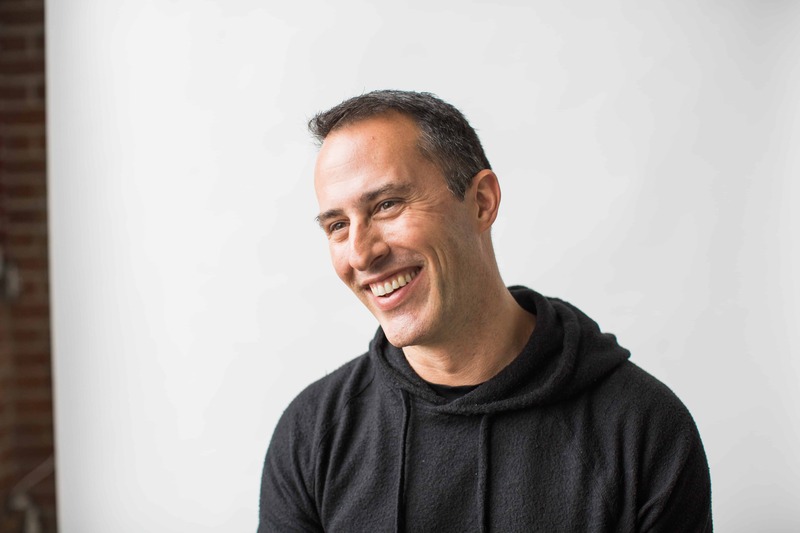 Matt – I’ve never been a fan of subscription software for a variety of reasons but the latest moves by Adobe have reinforced it. Over the past few years I have kept to CS6 and LR6 standalone and spent a considerable time and effort (and money) in learning from educators like yourself , Tim Grey, Phlearn etc. and whilst I have no complaints about doing it no doubt you guys will progress all your videos / courses to the new Adobe ‘world’, so over the next 6 months I’ll move to some combination of ON1, Affinity, DxO or other alternatives and look for reliable educators. Thanks, Matt, very helpful as per usual! Appreciate your clear and down to earth explanations. Absolutely! I don’t like this cloud-based storage that Adobe is slowly forcing on us. I shouldn’t have to pay to access my own photos. If Adobe forces this on us as the only storage option in future “updates “, I will seriously consider switching to something else like CaptureOne. Matt, thanks for your exceptional video on the new LR Classic CC. I updated my LR 2015 to the new folder based LR. When I opened it non of my photos from my old catalog were available. I started importing my 2017 photos and all went well for a while. The next morning when I went to continue adding more photos, the previous imports did not show up. I am so frustrated with this program which I have used from the beginning. Can you please help me find out how to get my photos back in there. Hi Marcia – The only thing I can point you to is your Folders panel. If the photos are there, that’s where you should find them. Thanks for your input. I live outside the USA and currency exchange rates vary all the time. Therefor I’m scared to commit myself to a subscription. I do have CS6, Lr6 and ON1 2018. Thank you for starting to include Affinity in your teaching. Will it be possible in future to replace Lr with On1 ans PS CS6 With Affinity Photo and will it be possible to Link these last 2 the same way as Lr and PS or at least to get a plug-in link between ON1 and Affinity. Hi Martin – unfortunately those are all questions I can’t answer. I don’t foresee ON1 and Affinity talking to each other natively like LR and PS. Two separate companies. Right now you could easily edit a photo in ON1 and open that same photo in Affinity. But they just won’t talk to each other. However, edits should work just fine. Good luck! I agree with Matt. They should be lr cc (hard drives) and lr mobile cc. Thanks for your timely warnings. I “upgraded” to Lightroom classic and it advised me that I had a 7 day trial before I had to subscribe to CC – no option to continue with my paid for licensed version. Fortunately I have a backup… I have no intention of subscribing to CC, even if the cost is similar to yearly upgrades, because when I can no longer afford the subscription or upgrade I still want to be able to use and edit my photos. I am looking forward to On1 Raw 2018 becoming suitable for full time use. Thanks for a clear, no nonsense, unbiased analysis of the two programs. I’m looking forward to seeing you at Nature Visions in Manassas, VA on November 3-5. Maybe by then the cloud of confusion about Lightroom Classic and CC will have settled somewhat. If everyone would read what you’ve written here then perhaps your Q & A at the end of your presentation at Nature Visions will not be dominated by the Classic/CC confusion. I use two macs – a desktop and a MacBook Pro; I edit on both and use an external drive that I swap back and forth to keep things in sync. I was excited about the cloud plan because I thought that would allow me to get rid of the external drive. However, it’s clear to me I want a lot of the features in LR Classic that aren’t in LR CC. is there any easy way to keep those catalogs and photos in sync? Hi Nancy. No, they’re two separate programs. I updated my iMac Lightroom CC 2015 to Lightroom Classic. I then got on my MacBook Pro and do not see either new Lightroom available as upgrade options. I am logged into Adobe. Help!!! Is it possible to be a BOTH kind of user? I shoot DSLR and love my Lightroom CC workflow. But truth is, I’m shooting a TON of photo with my iPhone and truly would like a better workflow for those photos, and to have those photos available in both places (my phone and my desktop so they get backed up locally too). Thoughts? Hi Matt, Thanks loads for for the summary of info and the updates. I haven’t read through the whole thread so I don’t know if this has been mentioned already. When I first saw the new names after getting the invitation for kelbyone users to beta them I didn’t see an explanation of the difference between the two. I’ve been busy so I easily could have missed it. However, even after knowing the difference it seems that the name change could have been to Lightroom CM (Creative Mobile) to make things clear instead of using the old name for a new product. Duh. I, too, have invested time in learning the stand alone version of LR and don’t see myself affording the Creative Cloud subscription. I’m disappointed that it’s likely Adobe will abandon LR after v6. I have purchased ON1, but I gotta say it keeps getting updated and moving around faster than I can keep up. If they’d hold it still for 6 months I’d invest the time in learning it and move over from LR, but I am constantly bombarded with info and updates and just can’t keep up. Yes I’m very confused. I just purchased the light room and photoshop cc photo bundle. So what your saying is I can’t save my edited photos to my regular hard drive Folders? Where do they Go? Is this just a way to have to keep paying monthly. By keeping our photos as ransom ? I’m disappointed that I’m such a gullible Newby. Hi Chris – Nothing changes for you. If you’re a hard drive/ folder users, then new LRCC isn’t for you and you should continue to use the LR you have (now called LR Classic). Nothing will be different. It’s only if you decide to move to the new cloud based mobile version which sounds like I wouldn’t recommend for you. And by the way… even if you go with the new Cloud Based ones, your photos are never held for ransom. If you choose not to subscribe, you can simply download anything you had in the cloud and keep it. I think there’s even a free grace period. Thanks for the overview of this new functionality….which looks like a great addition! Thanks for the explanation Matt. It seems to me that Adobe is now catering to the professional photographers that use LR constantly and the masses that mainly use their phones to take photos. I fall in neither of those two groups. I consider myself to be a serious amateur photographer (several high end DSLRs, lenses, tripods, Subal underwater housing, etc). I primarily take photos on trips then edit them afterwards. Since I have a regular day job, I will sometimes go for months without using LR so I have seen no point in paying a monthly fee for something I’m not using. Using ON1 as a standalone system rather than just a plugin may be in my future. Thanks Tom. Though I disagree about the pro photographer. I think LR Classic is catered exactly to you. I think the reason for giving the new Lightroom product the CC name, is that Lightroom Classic will eventually be replaced by Lightroom CC. They’ll probably wait until CC is more mature and has the features and power that Classic has. If CC in the future is as good as Classic, I’d be ok with that. Hopefully between now and then they’ll provide a method of managing local storage for those who do not want to pay for or use cloud based storage in CC. But $9.99 for 1 TB sounds like a pretty good deal. thank you for the video on the new features in Lightroom Classic. Very helpful. Plus I have to say that it is a very fair move to provide some free updates to your Lightroom Course. Looking forward to that as well. Matt! Thanks for the intro to the changes! Very cool and you, as always, are clear and interesting! Dear Matt, You explain so clearly what Adobe makes complex…I love you for this! Isn’t there 3 Lightrooms then? Lightroom CC, Lightroom Classic, and Lightroom Mobile? What is the difference between the new Lightroom CC and Lightroom Mobile? Lightroom Mobile is on the tablet/phone. The new LR CC is on the desktop/laptop. LR Mobile is it’s counterpart on your devices. on my laptop when I am on long trips. Would I be able to use Lightroom Classic on my laptop when away , and on my desktop at home? Hey Theresa – yes. Nothing changes for you except for the name. It’s the same exact program except now it’ll say Lightroom Classic at the top instead of LR 6. Thx. I bet it does! 🙂 You should have received a free update today in your email. Let us know if you haven’t . Thanks for the great info Matt. I’m reminded of the Coca-Cola fiasco of 30 years ago. The geniuses at Coca-Cola came up with a new product and called it New Coke. People universally hated it and they had to bring back the old product, which they rebranded as Coca-Cola Classic. That’s all it takes to convince me that LR Classic is the right product for me. I knew that when Adobe went to the CC scheme that Lightroom would eventually go away as a stand-alone (despite them saying it would not go away). This is just their way of forcing those have have grown dependent on the software into becoming paid subscribers to the CC. Also, the whole naming thing makes no sense. Thanks Matt for keeping us all up to date! Do you think that Classic is a short lived product? Do you think that Adobe will push everyone to the cloud? Well Matt, thanks for the informative update with advice on the different programs. However, to make matters more confusing the revised version of Lightroom CC 2015 is Lightroom Classic CC, not just Lightroom Classic. I’m sure that Adobe is getting a spam-load of “what-in-the heck-is-going-on” customer input with these naming conventions. They ought to get new branding staff because the ones that they have appear to be out of touch with common sense and their customers. Or is it planned subterfuge of the cloud?. I’m sure that Classis CC will perform better than the former CC and we’ll all check it out. On1 just put out Beta 2 of Photo RAW 2018 and I can say that, absent of a few features, On1 has nudged ahead of Adobe on ease, depth, and functionality for this level of post-processing software. Two features that are begrudgingly holding me to LR C CC as a start to my workflow are managed Imports with renaming and Map. Matt, Al again. I’ve been on hold on Adobe support. Please tell your contacts at Adobe that I am a very upset customer, very upset! If you can please forward my email or send me an Adobe contact. I downloaded LR CC program and then opened it and also updated the iOS LR app. Without notice all of the photos on my phone appeared in the LR CC desktop application without options for preferences or any type of notifications; the iOS app was downloaded on my phone but not opened. There are some business intellectual property photos that are apparently on the cloud, some of the photos were taken today. I want them off, now! And verified that they are off! With the former LR Mobile I had complete control over what was transferred using Collections and selecting which ones to synch. We need notice and control over what gets uploaded! Adobe does not have that right and authority. Regardless of strength of firewalls and encryption, there is a level of vulnerability for everything on the Web. I have used the LTR since the beginning. It took me forever to really learn it. I have spent $$ on buying presets from you and a few other photographers. I love them. So, when it stops working ( if I get a new computer) what happens to the presets I bought? So more $$ out the window. I have some other new programs but none really come up to the standard that LTR is with the photo management, I love that. I am so torn as to what to do, but will wait it out I think. I would like to update to ver. 6.12, but cannot figure out how to. In the update menu bar, nothing happens. Thanks Matt, I appreciate all the info you give out to us. Well when LR 6 gets updated on 28th I’ll be going back to my stand alone perpetual license Lightroom and when that can no longer handle new cameras I’ll move on to another software product from another company. Why does this suddenly feel like Adobe’s first step in abandoning power users? All I want for Christmas is a faster LR (Classic). I was at the Ignite conference last month and talked to Adobe. They said they are seeing a large population of users moving back to Windows10 from Mac (myself included) and we should start seeing more features aimed at those users. Can you elaborate what they are talking about? I’m assuming they are talking about the Surface Dial, Pen, and touch, but are there more features you are aware of. There is something that worries me over this new cloud-based Lightroom CC. And that’s this, let’s say Adobe make’s again a bold move ( like going to Creative cloud) en complete ditch the classic version. Then we have to pay for the software AND the storage of our photos. I don’t think this will happen anytime soon, but still it worries me as a photographer. 1) Stay with the same LR you know and love which is now called LR Classic. Nothing changes for you and you don’t pay any more money. 2) Switch to LR CC (the new program). It is all cloud based. You can get 1TB for a few bucks more each month, but if you’re a DSLR shooter then 1TB won’t last for long. You’ll be paying $10 /month more for each additinoal TB of photos. So what you’re saying is already happened. Adobe isn’t trying to hide it or reel you in to using it and then make you pay. You already have to pay now if you want more. I believe You can manage your storage needs in your Creative Cloud account on Adobe’s website. Your explanation is clear yet I also remain cautious about the future of the standalone LR6 or LR Classic. With no updates I fear that LR Classic will become just that – Obsolete like an old car. To switch to LR CC would cost the monthly fee plus the extra amount for storage beyond 1TB. Is it not possible to store images on an existing Ex Dr. that is backed up as well and use LR CC for editing? That would make sense to me. I’m confused (though your explanation was great) – my updated LR Mobile on my ipad is now called LR CC. Presumably its just the name change and it will wirk just fine with my Lightroom Classic? Thanks for the explanation. One of my major complaints about the “old” Lightroom CC is that it was a challenge to share catalogues in order to be able to edit RAW files on two different machines (desktop and laptop), while always having the “latest” version of your edits available across machines. The only way to edit on different devices was to export a catalogue onto an external hard drive, and open the catalogue on my laptop – very tedious. Can I assume that the “new” lightroom CC will now allow this? This would be a game changer for me. Matt, great overview. I went ahead and updated Lightroom on my PC and was very surprised that it is now called Lightroom CC, version 2015.12. Seems like they would have updated the naming. And what with the ‘2015’ versioning still? Thank you! Thank you! There are so many posts about the Lightroom changes online today. You are the only resource I needed. You gave a simple, down-to-earth explanation that I understand. I was able to make a clear decision without having to go to other resources. You saved me a lot of time. All your hard work is truly appreciated. Cheers…. I only have one question about the Lightroom Classic. Will I be able to sync my photos to Lightroom Mobile using Collections and view them on my iPad and iPhone? Thank you Mat for the explanation it is very help full ! Thanks Matt for your usual clearly written review! It’s the only one I’ve actually understood so far. And, thanks for the update to the Ultimate LR package. I will be sticking with Classic – and wondering who on earth made the naming decision!! Absolutely crazy. Hear, hear! The naming decision also made me wince. I agree, the new name is a marketing disaster for Adobe. Excellent explanation of Adobe’s attempt to differentiate LR products. I’ve moved on to ON1. See you on ON1 tutorials. .
My biggest concern is that LR Classic will go away in a couple of years once LRCC has added enough features. Are there any indicators of that? I’m just wondering if I should start doing a serious investigation for alternatives now, rather than when we get punched in the gut. A name like “Lightroom Classic” does the opposite of inspire confidence. Thank you Matt. Your article cleared up a lot of confusion and it was very helpful that you kept putting in parentheses (now LR Classic) because well…it is all very confusing. Also was good to get clear that there are now 2 LR programs. My first read somewhere else freaked me out thinking I have to upgrade to the new now CC and will never have enough cloud space. Phew. Thanks! Well done! Lightroom CC Professional and the new one Lightroom CC Mobile? Since Lightroom CC is for more the mobile device user, It would be more of a desktop version of Lightroom Mobile anyway. Thank you for saving me the time and effort to figure out which Lightroom plan to go with. I will continue with the now “Classic” version and continue to showcase my photos through Lightroom Mobile. Dear Matt, thanks for the heads up and the clear explanation. However, ,I am not sure if the following point has been covered – I do take photos on my iPhone as well as my DSLR (when you’re up a mountain the iphone makes sense . I can then open LR mobile and look at the camera roll and swipe across any such photos that I want to process using LR. The only logic I can see behind the current move is if Adobe wants to generate further income and that ultimately it may try to do that by eliminating LR mobile and making people get both classic and CC. Thoughts? Hi Ian – you could use LR Classic an LR Mobile for that just the same way it works today. Great summary. Too bad, that to be clear you’ve had to repeat that the new name for Lr CC is Lr Classic and that the new Lr CC is different … over and over and over again. I think Scott Adams’s cartoon “Dilbert” has some relevance here: Catbert, the evil HR manager, must have hired Adobe’s marketing team. Actually Richard, it was probably the other way around! Catbert knows how to really fix things up real good, as evidenced quite often in the strip. I just didn’t know that he moonlighted, but I guess Adobe “knew” a good thing when they saw it. Thank you Matt. Can I experiment with LR CC by starting a new catalogue and still use Classic? Yep David – they don’t talk or interact with each other in any way. Experiment away! Matt – I’m confused by your saying they don’t interact at all. In Lightroom CC I see all my collections that were synced to LR Mobile before, and I could make changes in LR CC that sync back to LR Classic including album/collection name changes (but not folders or collection sets). I do understand that full size files won’t move back and forth, but as I understand it, LR CC should still work on the smart previews on mobile, web, LR CC on another computer. Is that not what your understand? Does this mean that Lightroom 6 as a perpetual licence will be abandoned forcing users to go to subscription? I’ve been happy with LR 4.4 but I’ll start looking elsewhere. Appreciate your honesty and time to suggest something else. Thanks for the great summary Matt and for hammering home the difference between the two. As a customer of yours and the Ultimate Lightroom Course, I really appreciate you sending us updates at no cost. I know this is a lot of work for you and you are more interested in your clients getting the best information possible while not draining us of our cash. That’s why I keep buying your stuff. Solid teaching from someone that really cares. I am a designer who subscribes to the entire CC Suite. Do I get the 1TB cloud storage? But I like the idea of having cloud access if the implementation isn’t too much of a bandwidth hog. Robert, the all apps plan only comes with 100GB of storage. I spent over an hour on chat support to finally get an answer that I have to purchase a Lightroom CC plan in parallel to get 1TB or more storage, at ~$10 per TB. They have 2TB, 5TB, and 10TB. They do not seem to have any storage upgrade plans for all apps users yet. Thanks Matt, another great review! Thanks for your diligence and professionalism! Thank you Matt for the summary and mostly for the updates to your course. You’re the best. I agree with the question above: Why rename the existing program and give the new program the name of the old program? They should have left it alone and named the new one Lightroom Mobile or Lightroom Go. It looks like Adobe is catering to the masses on this one. How many users have a hi-res portable camera vs. a DSLR? Make them feel inclusive to the Adobe world and us “classic” users will not give up the product, but simply accept the change. Thanks for the great summary, Matt. I, like you, use a hard drive based workflow, so ‘classic’ continues to makes sense to me. I don’t take a ton of photos with my cell phone, but it would be nice to easily incorporate those photos to my lightroom catalog. I find myself dragging a copy to my hard drive and import to lightroom. It’s not optimal, but it works. My greatest fear is forgetting or missing something good. Hey Wayne – that’s exactly what LR Mobile is for. I don’t take many cell phone photos, but I use LR Mobile a TON. Definitely look in to it. Wait a minute, I’m confused now. So I am tracking 250,000+ photos in Lightroom CC 2015, I also use Lightroom Mobile. Does Lightroom CC 2017 replace Lightroom Mobile on my phone/iPad? You mentioned it an earlier post that I will still be able to sync my photos from my phone to my desktop via the cloud, like I am now. But will I need new software for my phone and iPad too? I like to think of myself as pretty tech savey, but this is giving me a headach. I’m sure it will all work out in short order, but right now I would really like to update my desktop so that I can get RAW support for my D850. What say you? Hi matt, looks like the update has not reached the UK yet, thanks for the advice, looks like I’m with you and gonna stick to Lightroom Classic. But I’m having a hard time finding it. Is it a slow roll out or something? Have updated, restarted, checked for new updates on the creative cloud app. No Lightroom CC. Only classic. I’m sure you “could” but I wouldn’t recommend mixing the two or exporting back and forth or anything similar. If you do use the new LR CC, I’d keep it totally separate and would “bring” anything together. Thanks, Matt, for the quick and clear explanation. And for sending out updates to your course. I’ll be looking out for it. You got it Anna. You should get them some time today. Thanks! That’s an awesome service Matt! Thanks for doing this! This is crazy – not so much the products, but the names. Why create a new program and take the existing name and give it to the new program,. while the old one remains. So confusing. What are the ramifications of these changes to Lightroom Mobile? Will photos taken with that tool continue to be synced with Lightroom Classic CC? Or now with Lightroom CC? Both? Yes. Both LR Classic and the new CC use Collections/Albums. LR Mobile will sync to both. LR Mobile seems to have been Adobe’s plan to make mobile and desktop able to play nice together…. seems to me it would have been nice if they just stayed with the plan… or what am I missing here? Hi Linda – LR Mobile works exactly the way it always did even if you use the old LR Classic plan. Nothing changes for you except the name of the desktop app is now called LR Classic. Everything else (including LR on the phone or tablet) works exactly the same. Thanks for this comprehensive summary. But I have to say. Why not just give the new Lightroom CC a new name? They have had a product in Lightroom for a decade, and that product is being renamed to Lightoom Classic, and the old name is given to a new and incompatible product. Nothing like sowing the seeds of confusion! Matt, thank you very much for explaining the new Lightroom CC. I was very confused about it and you made it very plain to me that I neither need nor want it. Saved me a lot of trouble and grief! The new naming is a big clue as to which product will be staying for the long haul and which will soon be going. Or in other words which one Adobe cares about and which one it doesn’t!! !